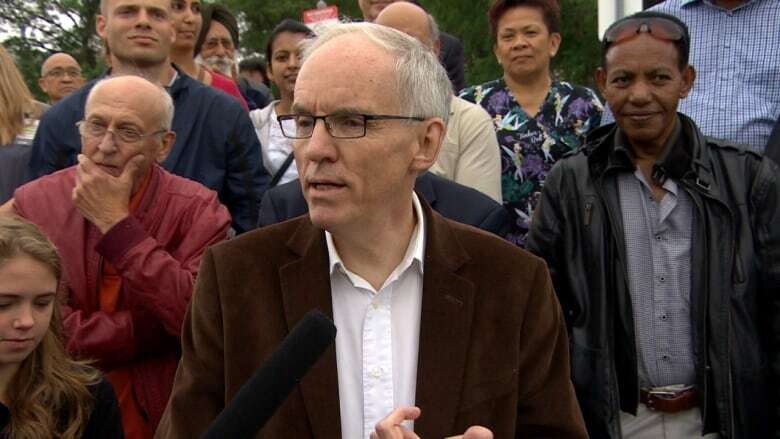 Steve Ashton officially entered the race to lead the Manitoba NDP with a campaign event outside Concordia Hospital on Wednesday morning. Steve Ashton vows to reinvest in community hospitals and rebuild the Manitoba NDP in rural Manitoba if he's elected leader of the party. The former cabinet minister and longtime Thompson MLA held a campaign event outside Concordia Hospital Wednesday morning to officially enter the leadership race. Ashton took aim at the Progressive Conservatives' decision to close three emergency rooms, at Concordia, Victoria and Seven Oaks Hospitals, accusing them of not having a plan. "That's when it struck me that what we really need to do is not just talk internally about as New Democrats, about what we need to do to rebuild, but to reach out to Manitobans and to build a progressive alternative for 2020," he said. He also said the party needs to rebuild its support beyond the city of Winnipeg if it wants to win the next election. "For the Manitoba NDP not to have a single MLA in rural Manitoba, that's a real priority for me," he said. Ashton is the only candidate running against Fort Rouge MLA Wab Kinew for the leadership. Ashton represented the Thompson constituency from 1981 until last year, when he lost his seat to Kelly Bindle of the Progressive Conservatives. Interim NDP leader Flor Marcelino spoke at the event, endorsing Ashton for the leadership. "You've never wavered in your values and principles," said Marcelino. "Through good times and bad you were NDP, for social justice and equality, and this is what we need." Other Ashton supporters include Elmwood MLA Jim Maloway and East Kildonan city Coun. Jason Schreyer. This is Ashton's third run for the top job of the Manitoba NDP. In 2009, he came in second, losing to Greg Selinger with 34 per cent of delegate votes at a leadership convention. In 2015, he finished last in a three-way race against Selinger and Theresa Oswald with 30 per cent of the vote. Ashton also promised to follow the example of other provinces, including Ontario, to raise the minimum wage to $15 an hour in the first year of an NDP mandate. He said this is faster than the Progressive Conservative plan, which is to tie increases to the rate of inflation. It's also faster than the plan proposed by Ashton's rival. Kinew wants to reach $15 an hour by the end of the NDP's first four-year mandate, if they get into office again. The NDP would also lower university tuition, Ashton said, should he become leader. Ashton said controversy over the purchase of Tiger Dam flood fighting equipment in 2014 shouldn't affect his leadership bid. Manitoba's Ombudsman released a scathing report saying he ignored advice and concerns from senior government staff about buying the equipment. Ashton said he "learned a lesson" in the aftermath of the scandal and realizes now the purchases should have gone to tender. He said the issue is now "in the rear view mirror," and wants to focus on the future during his leadership bid. Kinew was in Toronto Tuesday night to throw the first pitch at the Blue Jays game against the Baltimore Orioles. He said he's been operating on the assumption he'd have a competitor since he joined the race. "Steve and I have different visions for the NDP," Kinew said in a written statement emailed to CBC news by a spokesperson. "It's clear to me that the party needs a new direction, one focused on listening to Manitobans, creating the jobs of the future, and building communities we all want to live in. Last election, Manitobans told us that to get there we will need new leadership. I hope to be that leader, and with the support of party members, bring the next generation of New Democrats to government." Fort Garry-Riverview MLA James Allum and Concordia MLA Matt Wiebe, both supporters of Kinew, said Ashton can't offer the kind of change party members are looking for. "I personally don't think it's a good idea," Allum said of Ashton's decision to enter the race. "Manitobans are clearly looking for generational change in the NDP." Wiebe said he's glad there is more than one candidate for leader, but doesn't think Ashton has the right vision for the party. "I believe that it's time to turn the page. It's time to talk about the future of our party and the future of our province," said Wiebe. The deadline for candidates in the NDP leadership campaign to file is July 15.